Looks like you are off to a great start. I find this post very intriguing because I am considering starting a small set up in an Eclipse System Six for my room at university this semester. I can't decide between Asian (Rasboras or Gourami) or South American (Tetras or Corydoras). I am very interested to seeing how yours turns out. By the way, I think that hood is going to look really sharp too. Best wishes! Thanks for all the positive feedback. Since this is my first "nano" tank, it's good to know I'm on the right track. I'm still toying with ideas for plant selection. While I agree that java fern can get too big for this tank, the areas behind the wood don't really allow for planting of rooted plants (there isn't much room). I was thinking java fern would work back there, because it doesn't grow too quickly and I can always cycle it out if it gets too big for smaller pieces from my main tank. A Bacopa sounds like an idea for a stem plant. I did see one or two species of it at one of my LFS's. Of course, finding some of these plants has been a challenge. I have yet to locate Glosso, HC, or any type of hairgrass. I want some of these for my main tank (which I will also be re-aquascaping). The Superpet's around here stock Tropica plants, so maybe I'll see if they'll order specific species for me. the only Rasbora I can recommend for tank that small is the Rasbora maculatus (2.5cm) and the only Gourami that could be housed, but I would not recommend stocking fish bigger than 4 cm, in such small space, is the Dwarf Croaking Gourami (Trichopsis pumila 4cm). 5 Neon Tetras would be the max if you ask me and Coridoras are just not an option for such an unstable environment, they are too sensitive and deserve more space. Modding the intake tube hasn't caused any problems that I've noticed. It primes just fine when I start up the filter and the water flow is adequate. However, I have noticed that the Aquaclear 70 impeller is noisier than I would like. But then again, my Aquaclear 20 was quite noisy for a little while when I first got it. I'm hoping that a slime coat will build up and the filter will become much quieter. 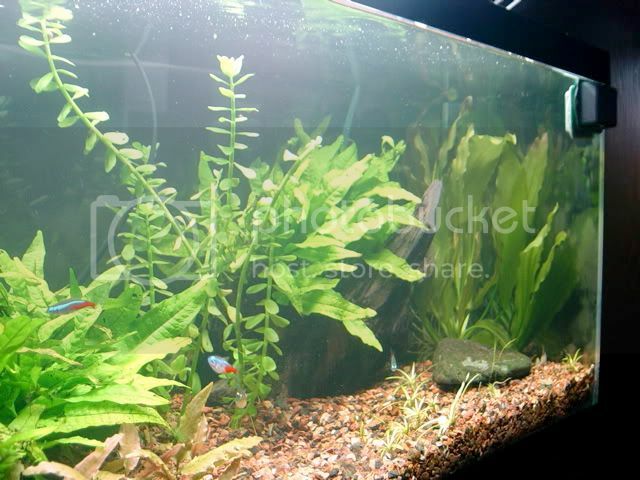 I just read your post, and Bacopa in my experience is a SUPER fast grower and will in no time over run your aquarium not leaving much space for the fish. All Bacopas, as far as I know, grow to over 30 cm and are very hard for aquascaping. My tank is 35 cm to the top...well, the smallest Bacopa australis grows over 40cm, and all that in 3 weeks time. I would not suggest Bacopas. I get your point with Java fern. I will plant it in my new 10 gallon in front of the box filter and if it becomes too big will move it to the 180 liters. Bacopa will grow tall, as you can see from this photo of my 20 gallon long tank, but it remains compact. The tallest stem in the photo is, as Dusko said, about 30 cm. The stems grow up and will trail across the top of the water. With the kind of lighting you have it should keep good leaf growth on the stems. I have 65 watts over 20 gallons and every two weeks I top the overgrown stems, trim the leaves off the bottom of the cuttings, and plant it in the substrate where I need to fill in space. You could start with just a few stems and since it does grow fast you could add cuttings to your other tanks. Just a thought. I finally finished the hood. It took awhile to paint, partially because of a spell of ridiculously humid weather and the fact that I screwed up the finishing. Note to self: don't apply finish to something covered in dust and grime. Here's the underside. I used pieces of lexan on which the Mini Aqualight is going to sit. I'm not sure if heat will be a problem, but I hope not. Also mounted the additional 9W bulb. And here it is on the tank. In retrospect, I probably should have made it a half inch shorter, since it looks pretty giant on that tank. It also shows the minor tweaks I made to the aquascape (more rocks and less sand). At the moment the Aquaclear 70 is no longer on the tank. I ended up using it for an outflow from my protein skimmer on my reef tank. As a result, I'm waiting for another Aquaclear 70 to arrive. I also have an order of plants I'm waiting to hear about, so hopefully I'll get both by next week and can begin planting this thing. That looks great!!! Only thing I can see is it does look a little yellow!! I can't wait to see this bad boy planted! what is your total wpg that you have there and what types of plants are you going to plant . mshaeffer, the yellowing is caused by tannins from the driftwood staining the water. I'm hoping that a water change or two will eventually clear things up. danny1, I have 27 watts total, so that's about 4.9 wpg. Of course, the wpg rule doesn't quite apply to small tanks, so it's probably the equivilant of 3 wpg on a larger tank. For plants I was thinking either Glossostigma or Hemianthus callitrichoides for the foreground, and dwarf anubius and Hydrocotyle verticillata for the middle ground. I'm still undecided on which plants to use for the background, but I'll probably use java fern in behind the wood. Unforunately, it's going to be awhile longer before I can plant this tank. I had some plants on order (both glosso and HC) from a local LFS. They were supposed to come in last Friday, but their supplier shipped them the wrong plants! So now it's probably going to be another few weeks before I get them.